I’ve done two rounds of Seven Deadly Sins prompts, mostly because I have such a large pool of characters to draw from. While flipping through other prompt suggestions, I happened to find a list of the Seven Heavenly Virtues (which seem to get a lot less press). In case you’ve never heard of them, they are: Chastity, Temperance, Charity, Diligence, Patience, Kindness and Humility. So now that we’ve seen the darker sides of my characters, why don’t we take a peek at their virtues? This week features Silkfoot, who is ever the diligent thief. Diligence; constant and earnest effort to accomplish what is undertaken; persistent exertion of body or mind. “Have you heard that they’re planning to move the Mirror of Enthdrada again?” Silkfoot Lightvolt placed one hand on the edge of his first mate’s newspaper, drawing it down until he could see the other man’s face. At the same time, one of his cream-colored eyebrows drifted upward and a characteristic mischievous grin split his lips. He wasn’t even daunted by the slight frown that took up residence on Kestrel’s face at the interruption. 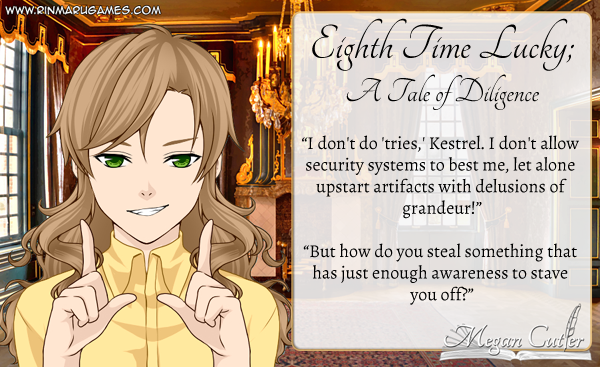 “You mean the same mirror that you’ve failed to steal seven times already?” Kestrel arched a single midnight eyebrow, mirth dancing across his lips to enhance his teasing tone. “It adds its own spin, don’t forget,” Silkfoot chided, waggling one finger as if he were disciplining a child. “That’s how it convinced me to take it back to its housing the first time. Cheeky little thing.” Once, it had shown him successfully making off with his prize and he hadn’t realized until he woke up the next morning that he had never even touched it. “I’m tempted to offer,” Silkfoot muttered. But he clapped his hands together, rubbing them eagerly for a moment before he pulled his phone from his pocket. He had been keeping notes about this particular heist since the last time he attempted to steal the mirror, almost six years ago now. Kestrel threw his head backwards and laughed uproariously. Had he been anyone else, Silkfoot would have promised him a lifetime of blackmail in exchange for his mockery – and probably would have been prepared to deliver on it too. But while the man was busy laughing himself to tears, Silkfoot leaned his chin against one hand and smiled fondly at the shaking of the big man’s shoulders. He was too stoic for his own good, sometimes. “Are you finished?” He asked primly after a couple of minutes, pretending to be put off by the interruption. Pleased, Silkfoot tilted the screen of his phone so that Kestrel could see the considerable length of the list detailing preparations for this particular heist. Now that he was keen, he intended to add a few more pages of precautions, just for good measure. No half-baked magical artifact was going to get the better of him eight times in a row.